Mailing lists provide an easy way to communicate and exchange ideas within a larger group of people. 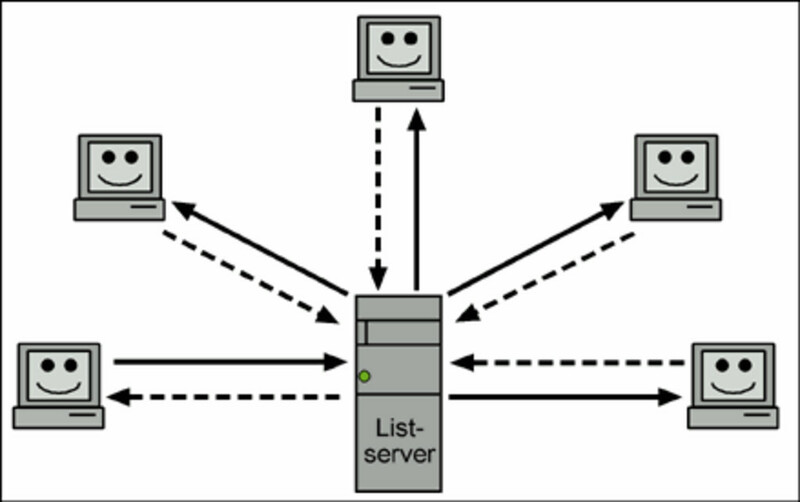 The list server works closely alongside the remaining mailing system. Externally, the mailing list appears to be a normal e-mail address. E-mails to this e-mail address are not stored in a mailbox but redirected to the list server. The list server checks if the sender and/or content of the mail violates any of the filter criterions of the mailing list. In a case of violation, the mail is send to a list administrator who decides whether the mail will be send to the members of the list or if it will be deleted. If the list server sends the e-mail to the mailing list, all members will receive it. The list of members is administrated centrally server-sided. It is sufficient to know the list address in order to send an e-mail to all members. The addresses of the list members are protected. Whoever sends an e-mail to the mailing list does not have to know the recipients. 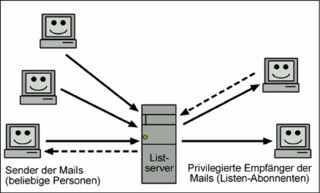 The list server can detect and intercept invalid e-mail addresses and report them to the list administrator or just delete them right away. Filter: Additionally, the list server provides the possibility to withhold an unwanted or dubious e-mail before it is sent to the members of the mailing list. In the same way a list can be completely moderated which means that a moderator has to accept mails before they are forwarded to the list members. Archiving: As a further feature, many list servers offer to store or archive mails of the list. For example, old mails can be made available on a website. A classical discussion list provides space for people who want to exchange ideas about a certain topic. 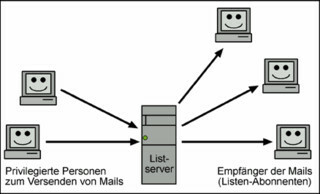 Such mailing lists can, for example, serve as a discussion platform for users of a certain software or optimize the communication within a work group. Discussion group as the standard form of mailing lists: Every member of the list can send mails to alle the other members. Privileged members (one or more) can inform members of the newsletter list about news, alterrations, or improvements. Such lists can be used to distribute internal news or to announce upcoming events for interested members. List server for newsletters: Members of the list receive mails but cannot send mails to the list themselves. The last possibility for the use of mailing lists, is the function of non-personalized e-mail addresses. For example, if an institution wants to be accessible via e-mail it can set up a mailing list and those people who administrate the mails of the institution can be registered as members of this list.